MOSCOW, August 30. /TASS/. Fragments of Russia’s Progress MS-08 cargo spacecraft, which was deorbited on Thursday following a weeklong experiment, splashed down in a remote area of the Pacific Ocean, a Russian Mission Control Center official said. "Unburied fragments of the Progress MS-08 spacecraft have landed in a non-navigational region of the Pacific Ocean," the source said. In accordance with the flight program, the Progress MS-08 undocked from the Russian segment of the International Space Station (ISS) on August 23, 2018. During the seven days that followed, it was used in a scientific experiment. 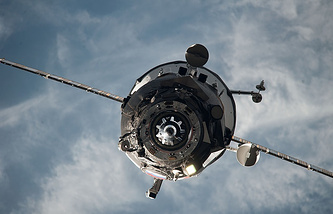 Progress MS-08 had been docked with the ISS since February 11, 2018. Currently, Progress MS-09 remains the only spacecraft of its series docked with the ISS. The next space freighter, Progress MS-10, will be sent to the space station in October.